The 180,000 sq. ft. School of Kinesiology and Recreation building is a hub for campus activity, and has revitalized the existing McCormick Hall, which was opened in 1925 and was remodeled in 1961, and the Student Fitness Center. Administrative, educational and instructional spaces were added in a new west addition to the building, which extends west toward Main Street, with portions spanning University Drive. The building provides multiple large recreation and academic venues to support existing and new programs. 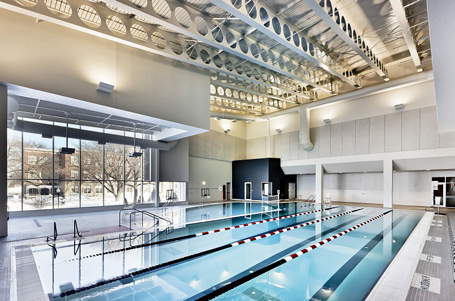 Counsilman-Hunsaker supported the PSA Dewberry team in the design of the new facility with an aquatic center, gymnasiums, basketball and racquetball courts, indoor track, weight rooms, exercise rooms, classrooms, climbing wall, locker facilities, faculty staff offices, classrooms and labs.